With the rise in academies and record high numbers of school leavers and international students accessing further education in Ireland & the UK, there is even greater pressure for educators to deliver academic results and financial returns. More emphasis is being placed on creating modern learning environments through the introduction of technology into the classroom, aimed at enhancing the learning experience of Generation Z and making the job of teaching them more meaningful. To that end, research suggests that a large proportion will be spent on improving technology in the classroom. It’s hard to imagine life without mobile technology, tablets and interactive touchscreens these days in spite of them only being around for a few years – they have become to Generation Z what the chalk board and slate were to Victorian children. Given the speed of change, tablets and other classroom technology will undoubtedly evolve over time but the biggest shift will be how we access it. The classroom of the future will therefore be one where devices are connected, where learning, sharing and collaboration is social regardless of physical geography and where data and software is stored in the cloud. To help schools, colleges and universities future proof their learning environments and select the most advanced touchscreen technology, we’ve created this guide to demystify the buying process for teachers, lecturers, bursars and business/IT managers so they can make an informed decision. An additional study from the National Literacy Trust and Pearson, published in December 2014, suggested that touchscreen computers are particularly useful in helping boys and poorer pupils to learn to read. The research showed how much technology is part of everyday life for young people. For example, children from poorer households are more likely to read on touchscreen computers than printed books and the benefits of using them to teach children with learning difficulties is significant. This was echoed by a head teacher in Essex, who stressed that schools need to exist in “the current century and not the last” in order to empower young people. The shift to touchscreen has also happened with larger interactive touchscreens, which now sit at the front of the classroom (think giant tablet). Interactive touchscreens have overtaken interactive whiteboards and projector systems – the first digital technology to be used by teachers in place of chalkboards and whiteboards. 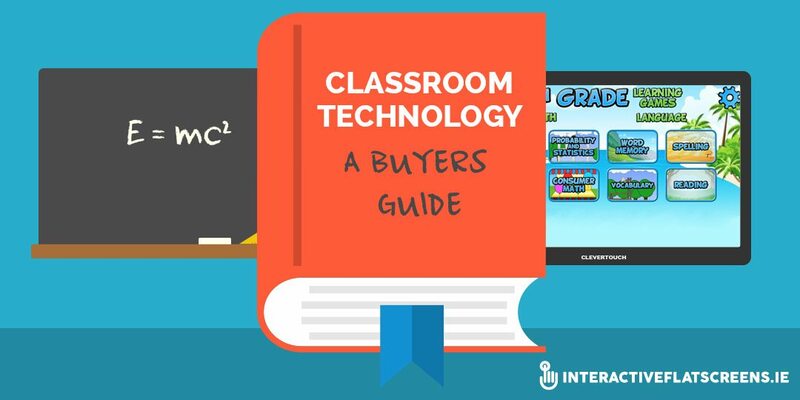 With the speed of change constantly biting at educators’ heels, the following buyers’ guide will show what’s going up and down in the world of touchscreen technology and where to invest precious budgets. Connected to a teacher’s lap top or PC and an interactive projector, an interactive whiteboard displays information from the connected device, which is controlled by touching the whiteboard screen. The technology behind interactive whiteboards is 15 years old and as such there is a compromise on the resolution of the projected image coupled with poor projector brightness, which degrades over time. Shadowing is a major drawback and the cost of all the necessary equipment and running costs has become more expensive than ‘total cost of ownership’ of second and third generation interactive touchscreens. Well-known brands include Promethean’s ActiveBoard, Cleverboard, the SMART Board and Hitachi’s StarBoard with prices ranging from €1500 for the interactive whiteboard and over €2,600 for the total installed solution. Unlike interactive whiteboards, interactive touchscreens connect directly to a lap top or PC and don’t need to be used in conjunction with an interactive projector. Some interactive touchscreens, like the Clevertouch, don’t even need to be connected to a computer. Much like a personal tablet, the Clevertouch Plus has an inbuilt operating system and can be used in conjunction with pupils’ personal tablets as well as a wide range of curriculum based teaching apps and IT ecosystems. Interactive touchscreen technology has been around for over 6 years but in the last 2-years brands like Clevertouch, BenQ, and Smart have upped their game significantly. Recent advances have done much to eliminate touch-lag, which previously hindered the formation of smaller letters on touchscreens. The latest technology tracks even the most subtle movements across a screen providing a massive leap forward in the quality of letter formation. Recent interactive whiteboard models use LED based sensors, which are far more sensitive than their predecessors. The Clevertouch Plus, which is released this year, goes one step further and includes its own Android app store with a range of downloadable teaching apps aimed at bringing lessons to life. 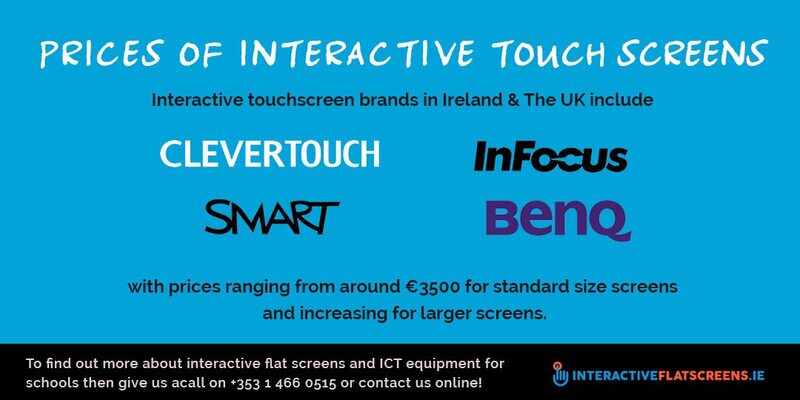 Interactive touchscreen brands in the UK include the Clevertouch, SMART, BenQ, & InFocus with prices ranging from around €3500 for standard size screens and increasing for larger screens. There are a number of considerations when introducing personal tablets into the classroom. They include cost, battery life, special features and most importantly the operating systems they use. Android tablets have the most widely used operating system and have access to the broadest range of free educational apps through Google’s Play Store. The iPad, which uses Apple’s proprietary operating system (iOS), is the number one choice in schools. Microsoft Windows RT, which is used with Windows Surface Tablets, Windows 8 and Windows Metro Tablets, is another popular option. The charity, Tablets for Schools, which we cited earlier in the Buyers’ Guide, is an excellent resource for educators wishing to bring tablets into the classroom. If you have received a grant and you are considering investing in ICT equipment for classrooms call us and speak to the Educational AV experts. We provide professional Installation and after sales support which is unparalleled. Call us on +353 1 4660515, email info@interactiveflatscreens.ie or contact us online now for more info.